TSPSC Assistant Professors Results, Certificates verification dates 2018 (DME Telangana):: TSPSC Assistant Professors Recruitment 2017 Hall tickets, Exam date, Results (DME Telangana). Applications are invited from the qualified candidates through the proforma Application to be made available on commissions website for the notification pertaining to the post of Assistant Professors in Director of Medical Education. 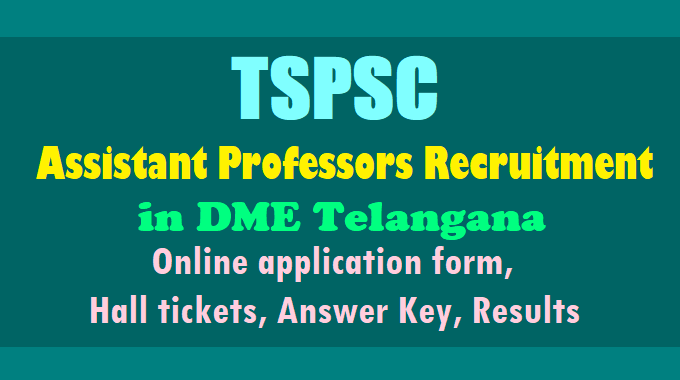 TSPSC To Recruit For Assistant Professor Post: Telangana State Public Service Commission (TSPSC) has released job notification for Assistant Professor recruitment in Director of Medical Education (HM&FW Dept). Recruitment process will begin on 16 September 2017 and candidates can apply through the proforma application to be made available on Commission's website. A total of 274 vacancies are open for recruitment out of which 20 are in the dental department, 94 in non clinical department, 96 in clinical department and the rest in super speciality department. Detailed job notification is available at the official website of the Commission at tspsc.gov.in. Assistant Professors in Director of Medical Education, : Notification no. 49/2017(General Recruitment) Selection Result Notification: On the basis of the verification of certificates held on 06/02/2018 and Interviews (Oral Test) held on 28/02/2018 at TSPSC Office, Hyderabad to the post of Assistant Professors (Super Specialty Department) in Director of Medical Education, the following Admission Numbers have been provisionally selected for appointment to the post of Assistant Professor (Super Specialty Department) vide Commission’s Notification No.49/2017 subject to the following conditions. 1) That success in the Interview confers no right to appointment unless the appointing authority is satisfied after such enquiry as the case may be considered necessary that the candidate having regard to her/his character and antecedents is suitable in all respects for appointment to the service. In order to be eligible for the recruitment applicants need to have the prescribed qualifications from MCI recognized medical college. In addition to this only those in the age group of 18-44 years are eligible for the recruitment. Further details in this regard can be found from the official notification. Applicants need to download the application form, fill it completely and submit it to the secretary, Telangana State Public Service Commission, Prathibha Bhavan, Nampally, Hyderabad - 500001 by registered post/ in person along with online application processing fee of Rs. 200. The Commission will select candidates on the basis of their academic and research performance record and interview performance, in total. WEB NOTE: It is hereby informed to the candidates who wish to apply for the above post, that the last date for submission of application is extended up to 15/11/2017, as the Government accorded permission to fill 205 additional vacancies of Assistant Professors in the Director of Medical Education vide GO.MS.NO.154,HM&FW Department,dt:24-10-2017. Further candidates are informed that the final breakup of provisional vacancies (including additional vacancies) will be available in the commission’s website (www.tspsc.gov.in) shortly. Post Code No. Name of the Post Department No. of Vacancies Age as on 01/07/2017 Min. Max. Scale of Pay Rs. Applicants must possess the qualifications from MCI recognized medical College and Experience as detailed below or equivalent thereto, as specified in the relevant Service Rules, indented by the department as on the Date of Notification. The particulars of Department/Subject wise requirements for Assistant Professors along with required specializations and Experience for Health Medical & Family Welfare Department are shown in notification. 1 Dental Surgery 2 1.OC(W) & 1.SC(W) Must possesses master degree (MDS) in any of the following specialties Prosthodonitcs / Oral Pathology / Conservative Dentistry and Endodontics / Oral Maxio Facial Surgery / Periodontics / Oral Medicine and Radiology / Public Health and Dentistry and Preventive Dentistry / Orthodontia / Pedodontia and other norms as per Dental council of India. Note: Candidates who have already applied with the above qualification for various specialties (subjects) need not to apply again their applications will be considered for this post also. The last date for submission of application is extended up to 30-11-2017. 12(1)(a)(v) of State and Subordinate Service Rules). FEE: (Remittance of Fee) Each applicant must pay Rs. 200/- (RUPEES TWO HUNDRED ONLY) towards Online Application Processing Fee. The Fee mentioned at Para-I(5)(a) is to be paid online through SBI ePay duly following online instructions once the application form details are submitted by filling TSPSC ID, date of birth and other particulars. The fee once remitted, shall not be refunded or adjusted under any circumstances. Failure to pay the application fee, wherever applicable will entail total rejection of application. The list of Banks providing service for the purpose of online remittance of fee is given in ANNEXURE – II. IMPORTANT NOTE:Candidates are requested to keep the details of the following documents ready while uploading their OTR Applications. i) The Applicants have to register on the TSPSC website & provide basic data online. ii) After that, the Applicants have to download the entire appropriate Application form from the TSPSC WEBSITE(http://www.tspsc.gov.in) and fill the requisite columns & enclose all the necessary documents (Publications, Experience Certificates, Research topics, Academic Contributions and other relevant certificates) and submit in Bound booklet format in triplicate (3 copies) to the secretary,Telangana State Public Service Commission, Prathibha Bhavan, Nampally, HYDEABAD - 500001 by Registered Post/In person. The Candidates are advised to visit Commissions website for detailed information and submission of application form 16/09/2017 and Last date for submission of application 30/11/2017.